Gran Tierra contributes to local, regional and national economic development in Colombia in many ways, including through taxes, royalties, jobs, local procurement of supplies and services, social investments, training and education programs and voluntary social and environmental programs. Gran Tierra has designed its employment and procurement procedures to maximize the opportunities for local and regional communities to capture the economic benefits associated with GTE project activities. This includes the local content in goods and services purchased directly by the project, as well as in those purchased indirectly by a project’s contractors. In Colombia certified welders are often in short supply in certain areas, such as the in the Middle Magdalena Valley (MMV) near GTE’s Acordionero operations. 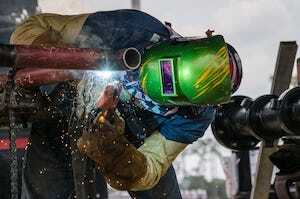 Skilled welding is a critical activity for any oil operation, and certification ensures that the thousands of welds necessary are completed with the required skill to prevent leaks or other issues that could impact safety or the environment. To meet this need, GTE created a training program to certify talented welders from the San Martín area as qualified practitioners in the specialized techniques that are used for drilling and production operations. By the end of 2017, six welders had been trained and certified through this program, all of whom have gone on to find jobs with GTE. Six more local welders are in training in 2018. Since 2010, Gran Tierra and Ecopetrol have been running a program called Finding Leaders, Generating Development in the Middle Magdalena Valley (MMV) and Putumayo to stimulate and support entrepreneurship in communities near GTE’s operations. The program was instituted to help support women who were not able to access energy-related job opportunities in the area as they were mostly given to men. As a result, over the years many of the program participants have been women. 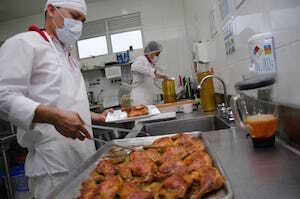 The program is a public/private partnership with SENA (Servicio Nacional de Aprendizaje), a national governmental institution that is part of the Colombian Ministry of Labor to develop education in Colombia and promote employment, which provides technical training and seed money when necessary. It provides support and advice to help participants develop and implement business ideas and is available to help with any needed adjustments along the way. In MMV, many of the ideas revolve around community development and are aimed at generating income. Recent ideas have included making bricks, chicken farming, yucca farming, opening an internet café and ice cream making. About 250 people have gone through the training in Morison, a town of 600, close to GTE’s MMV operations. The programs begin with providing participants with comprehensive Diploma Courses in leadership and business skills. A second phase follows, when participants can develop proposals for new business ideas. Once their proposals have been assessed and accepted, the aspiring entrepreneurs receive technical and business management training as they develop their craftsmanship and businesses. Gran Tierra then provides ongoing support and progress evaluations to make sure participants deliver robust business plans and are positioned to be successful. The Finding Leaders, Generating Development program supported entrepreneurship and leadership in 13 communities close to GTE’s operations in the Middle Magdalena Valley. In 2017, 254 men, women and young people participated, generating 62 business plans. The Creating Opportunities program, operated in Putumayo department, has resulted in 18 small enterprises being funded with seed capital. Mundo Creativo, a new business in the municipality of Villagarzón, that was created through this program, was founded by a group of 20 individuals with disabilities who wanted to become more self-sufficient and help support their families and settled on starting a stationery store. A shoe group in Morison called Calzado Unimor (Unimor Shoe Wear) has made hundreds of pairs of shoes after setting up the business through this program. Carmen Sorano is the President of the Artesanos de la Llana. When she moved to La Llana, (approximately 20 km away from GTE’s operations) eight years ago, she alone knew the special technique needed to weave traditional hats - a process that can take 4 or 5 days per hat. So, she decided to put her unique skill to use. After completing five diploma courses since 2012, Carmen came up with the idea and structure for running her current business more professionally. The Project to Strengthen the Competitiveness of Rural Associative Enterprises, or PROCOMPITE, is a unique initiative supported by a partnership between Gran Tierra, the Government of Canada and a Canadian NGO, the International Development Cooperation Society (SOCODEVI). The objective of this multi-year project is to promote sustainable economic growth in Colombian rural areas by strengthening the productive and entrepreneurial abilities of more than 6,000 agricultural producers, both men and women, representing 3,000 families. PROCOMPITE focuses on providing technical agro-economic assistance to family-owned companies as well as administrative and commercial strengthening. Since 2015, Gran Tierra has provided funding each year for PROCOMPITE, which is implemented by SOCODEVI. The project is focused on helping cocoa (cacao) farmers and small-scale cattle breeders near GTE’s operations in the Putumayo Department boost crop yields, lower production costs, improve management of farm assets, develop market links and reduce the risk of negative impacts on the environment. In total, 422 families, grouped into three agricultural organizations, have participated in and benefited from this program. Conducted 1,123 on-site technical assistance visits. Carried out 304 training sessions in Farmer Field Schools on technical, environmental, business and gender equality issues. Delivered 108 cocoa drying units. Provided hundreds of tool and nutrition kits for crops and cattle milking. Helped ranchers create 65 livestock investment plans. 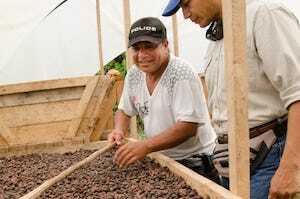 Oswaldo Pantoja is both a farmer and the president of the Villagarzón Cacao Growers Association. 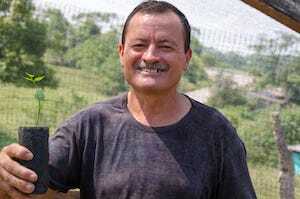 He grows multiple types of crops, including cacao and a fruit-producing palm called chontaduro. This is a traditional indigenous method of farming for better environmental balance and steadier cash flow. Cacao provides crops constantly, while chontaduro, which is a traditionally grown palm, provides fruit only once per year, causing dips and spikes in supply and demand, limiting the efficacy of chontaduro as a cash crop. The PROCOMPITE program teaches farmers new techniques, such as soil analysis, to improve production and also provides infrastructure investments like cacao drying facilities (pictured). This has enabled Oswaldo to optimize his harvest by more accurately utilizing fertilizer and analyzing how the water table levels might affect his crops. The PROCOMPITE project also focuses on helping the farmers improve the marketing of their crops by forming an association. The Villagarzón Cacao Growers Association now has 44 members from different municipalities from around Villagarzón and Puerto Guzman. The project also led to the construction of a commercialization center where the farmers can sell their crops. Another PROCOMPITE project supported by GTE involves cattle farmers in Villagarzón and surrounding areas. There are about 450 cattle growers in the area, 270 of whom are members of the Villagarzón Cattle Association, and 80 of whom participate in the PROCOMPITE program. The project has two goals: helping ranchers raise cattle more efficiently and helping them develop and bring to market alternative products that can increase their profitability. This training includes branding, cost analysis and financial accounting as well as new methods of cattle ranching. Modern techniques include live fences, better soil use, and paddock division. In their commercialization facility, the ranchers have learned to make new products such as a variety of cheeses and yogurt products from cows’ milk. SOCODEVI trains the association’s board every two weeks, with each session held at a different ranch. With better data being generated, the association can make more informed decisions leading to increased profitability. The association has begun to generate enough data to see if these new products, which have been received well so far, will be more profitable than the milk used for the cheese and yogurt, or whether they will need to adjust their approach. Gran Tierra has also supported a project in Putumayo to teach farmers how to grow and market black pepper, a high demand crop in Colombia. The goal of the program is to improve local income and food security and create alternative livelihoods for former coca growers. GTE has provided nearly $200,000 and dedicated three technicians to the Pepper Project, and local communities have contributed supplementary materials and labour. By 2017, 69 farmers from the villages in and near the municipality of Villagarzón had participated in the project, whose “Association of Agricultural Entrepreneurs for Peace—Species Putumayo” includes communities represented by Indigenous people, African descendants and colonial settlers. Currently the association has 26,685 pepper seedlings established, representing 27.4 hectares in an arrangement of 900 seedlings per hectare. In the first phase, participants spend six months at agricultural schools where they are taught how to use seeds, prevent plant diseases, handle soil and crops, form associations and set goals for production. In the second phase the program helps the farmers work their fields and monitors their progress. As a result of the training the farmers become knowledgeable about plant science, biological and chemical supplies, basic tools, agricultural skills and materials for seeding the ground. In addition to the training provided to all participants, some trainees are selected for an additional training module and for additional equipment after showing themselves to be particularly interested and motivated. During 2017, activities included improving agronomic and post-harvest activities and the design of a prototype solar dryer that will improve pepper drying times and the quality of the final product. Following planting, it takes two years before the peppers mature and provide income. However, peppers have an advantage over other crops that can be grown in the region because the harvest can be dried and sold when prices are highest, providing a steady income. Another benefit of the project is that this new agricultural crop will strengthen commercial companies in the region, such as Condimentos Putumayo, which has a direct influence on the economy of the municipalities. Cumulative production estimated for the year 2019 is 117.3 tons of peppers per year. The program has also strengthened the social fabric in the area with the establishment of a 43-member association of pepper producers in Villagarzón. Sociedad de Servicios Integrados Petroleros Ltda (SOSIP) is a small, privately owned catering company in Villagarzón in Putumayo that exemplifies how Gran Tierra’s relationship with local subcontractors can generate benefits not only for the company’s owners and employees but also for other businesses. Founded 17 years ago by two men, one of whom was Arturo Ortego, who worked in a restaurant, SOSIP evolved into a catering business with 15 employees and a number of clients. Now, after providing catering services to Gran Tierra for seven years, SOSIP has grown significantly with 53 people servicing GTE in multiple capacities, including catering. Arturo attributes one of the reasons for his company’s success to the education and training they received about catering best practices and enterprise management in order to meet GTE’s high standards. SOSIP’s growth has had a significant positive impact on Villagarzón and other local communities. The company hired 100% of its unskilled labor and 99% of its skilled workers from the Villagarzón area. Along with other small companies that GTE is contracting with, such as a transportation company and a landscaping firm, SOSIP is part of a domino effect that impacts the community in that all of these companies buy locally and their employees spend their money in the local economy. In addition to paying salaries and buying goods, SOSIP regularly invests in social projects in the area, such as supporting mothers and children, some of whom are orphans or victims of violence.